Beirut- Verbal clashes have escalated between the pro-Syrian former minister Suleiman Franjieh, and the ant-Syrian parliament majority leader MP Saad Hariri. Franjieh the Grandson of former president Suleiman Franjieh launched a scathing attack on the Future Movement leader saying that his honor was more important than "Hariri, his father and his whole family." "Saad Hariri has always been a boy and will always remain one," Franjieh said Tuesday in a tirade against the parliamentary majority leader. The latest tension between the two sides surfaced when Franjieh, who was interior minister when ex-Premier Rafik Hariri was murdered in a Feb. 2005 blast, claimed that he had been asked to state that the explosion was the result of an underground bombing. In a television interview Sunday, Franjieh said Hariri's life insurance policy did not cover him in case he was killed in a suicide bombing. "They wanted us to say that the bombing was underground to cash their policy," he said. Hariri responded by filing a libel and slander lawsuit against the pro-Syrian Franjieh, the leader of the Marada Party which is based in North Lebanon. A statement issued by Hariri's office on Tuesday accused Franjieh of trying to stir sectarian strife in Lebanon by first hurling insults at Druze leader Walid Jumblatt and then Hariri. 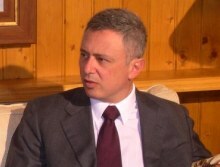 Franjieh fired back saying he will not be intimidated by legal actions and called on the judiciary to be fair. "We are ready and we hope the Lebanese judiciary will be fair and honest and not behave like the evaluation committee of Solidere," Franjieh said. The Hariri family owns the majority of shares in Solidere, the real estate giant founded by the slain former PM and credited with rebuilding downtown Beirut after the war. Critics, including Franjieh, argue that the company bought the land from its owners at cheap prices and is selling it at high rates. Franjieh said that while he drinks from the springs of Ehden, the northern mountain resort near his hometown of Zghorta, the Hariri family drinks desalinated sea water. "Our honor is more important than Hariri, his father and his whole family," the former minister said. After meeting Hezbollah leader Sayyed Hassan Nasrallah, he said he will keep responding to all accusations launched at him by any member of the Future Movement by attacking Hariri himself. Ya Libnan's Damascus correspondent has reported that his sources in Syria have told him that Syria's allies in Lebanon have received orders from Damascus to escalate their attacks on the anti-Syrian forces. Syria's President Bashar Assad and Foreign Minister Walid Moallem, have started the attacks on Siniora 2 weeks ago and ever since then, one Pro-Syrian politician after another has been attacking the members of the anti-Syrian majority. Franjieh's verbal attack is the latest incident. His attack on Hariri was not a surprise to anyone, because his Grandfather was behind Syria's occupation of Lebanon for nearly 3 decades. It was his grandfather that officially requested Syria to invade Lebanon when he was the president of the country. The young Franjieh is a staunch pro-Syrian ally. He failed in the last elections and blamed his failure on Hariri who's allies won all the seats in Northern Lebanon. General Aoun who has aligned himself with the pro-Syrian forces has also attacked verbally Saad Hariri, but the attacks stopped after the last meeting of the National Dialogue, in which a truce was declared. The attacks have been so far verbal only, but yesterday supporters of the pro-Syrian politician Wiam Wahab and members of the Syrian National Social party shot and killed one Jumblatt supporter and injured five more in Jahliyeh , a village in the Shouf region of Mount Lebanon. No one knows what is next! Ya Libnan correspondent reported that his sources told him "the Syrian regime is extremely worried about the results of the International investigation of Hariri's murder, since many senior members of the regime are suspects". He added " many of the suspects are close relatives of president Assad and the regime could collapse once the whole truth about Syria's involvement becomes public information"
Feedback? We want to hear your thoughts!